The right stroller can make going out with your baby a breeze. Since the first edition of our stroller guide was published, the stroller landscape has changed, and changed again; we’ve fully updated our guide. Out of over 30 models, we agree that the Mamas and Papas Armadillo Flip is the best stroller around, with a lightweight frame, an easy folding mechanism, and a fully reclining seat. Our journey towards stroller nirvana started with over 30 strollers. However, after our research and parent interviews, a list of must-have features were drawn up (more on that in a second), and strollers that didn’t have them were eliminated. This left us with only 14 models, which were then further cut down to the five that we thought were the best candidates. These were brought in for in-house testing with our crew of parents. Over the course of 36 hours of research and testing, we found that features like weight, ease of folding, and maneuverability were the most important to parents. Our selection achieves high marks all around. Parents and caregivers who want to walk around with their baby have two main options for gear: a baby carrier or a stroller. For most parents, owning at least one stroller is a must-have. Strollers enable you and your baby to walk around together, without the impediment of carrying an infant seat for restaurant or other stops. (We also love carriers, but they are a more involved and physical solution.) With a stroller, you’ll be able to walk down the sidewalk or around the park while carrying a lot of extra gear. Moving up from the wheels, you’ll want to have a good amount of storage in your basket—optimally, pockets on the sides or back of the seat, as well. This gives you flexibility to have things close at hand, yet stowed away. Next is the seat. You want a supportive seat that can be adjusted to be either upright or reclined, depending on what your baby is doing at any given moment. A lot of strollers also have seats that can be removed to face the parent, giving you a chance to bond and check-in on your child. A must-have feature in a full-size stroller is the ability to adapt to fit a car seat. Most full-size or standard strollers are compatible with an infant car seat, whether it’s with an adapter or it clicks right on top of the seat. We’ve created a handy Car Seat and Stroller Compatibility Guide so that you can more easily find out if two products work together. This combination, also called a travel system is key, because many strollers cannot accommodate infants on their own. This can be because the seat is not flat enough, a lack of a reclined position, or not having enough support for smaller babies. Our pick fits infants from day one, thanks to a fully-reclining seat, which offers excellent support for an infant as well as a growing toddler. Other good features to look for are a large canopy with sun protection, an easy-to-use harness and an adjustable handlebar that fits everyone who is going to push your stroller on a regular basis. Now getting all of the above does cost money, but you can get a perfectly adequate—and even pleasing-to-use—stroller for less than a couple of bills. A good stroller can go for as little as $150-$250, but you will get improved features and an overall better product if you spend more. Still, there are diminishing returns as you spend a lot more. Our research found that a good price to aim for is the $300 to $500 range. These strollers tend to offer the most value in terms of features and offer more durable materials as compared to the less expensive set. When you exceed that price range, you will certainly get nice upgrades in the fabric, materials and—to a certain extent—the design, but you won’t necessarily gain anything that that is critical to performance. After around $500 or so, you’re in the luxury market. We assembled three sets of parents and their babies and asked them to use our top five candidates in the real world. Folding, strolling, folding, strolling—and then folding and strolling. They adjusted the harnesses, reclined the seats, used them with car seats and drove them all over town to determine which ones were the best and easiest to use. While ride and maneuverability are important, the ease of folding and weight of the stroller are what really counts. It doesn’t matter how easy your stroller pushes if you can’t get it out of your trunk. Our pick weighs less than 20 pounds and has a convenient handle for carrying. Another bonus: the carrying handle and all of the other features are highlighted by yellow trim—you’ll know where the important bits are. We found that testers were able to walk up to the stroller and know what to do with little coaching. And if your car has a small trunk, don’t fear: the Flip fits into most small trunks, including (as the manufacturer boasts) the Fiat 500. There was a certain group of individuals who had a common gripe about our pick: the height of the handlebar. The Flip has a fixed-height handlebar, making the product feel exceptionally sturdy, but also somewhat uncomfortable for parents over six feet. To remedy this, there is an upscale model of our pick, aptly named the Mamas and Papas Armadillo Flip XT. The XT adds larger wheels, a ventilated canopy and a height adjustable leather-look handlebar. It carries a $600 price tag, and weighs about 3 pounds more, while retaining the same features that make us love the baseline Flip. Yup—an extra hundred dollars is a twenty percent price increase for a heavier stroller. Let’s revisit the compact fold. The Mamas and Papas Armadillo Flip XT (and by proxy our pick) are incredibly compact when folded. Many premium strollers fold in two pieces and take up the better part of a trunk or closet. This isn’t the case here. On top of that, the stroller folds inwards, protecting the cushioned neoprene seat. What also makes these two strollers so good at their job is that they are easy to carry. The Mamas and Papas Armadillo Flip XT and the Mamas and Papas Armadillo Flip have a dedicated carrying handle which is highlighted with a yellow trim. Plus, it’s already compact, so it’s easy to get your arms around to put in the trunk or to shove into the closet. For those who want upgraded wheels, fabrics and a bassinet that comes as a standard option, the Peg Perego Book Pop-Up is a logical upgrade at $800. The Book Pop-Up is the flagship model of the Book Line, with large rubber-tread wheels, plush fabrics, and a stand-alone bassinet that can be removed so that the stroller can be used with its fully-reclining and reversible seat. All of this weighs a laudably light 23.7 pounds. The Pop-Up gives parents everything that our pick did, with just a bit more style and comfort. We liked the heavily padded handlebar and that the stroller folds inwards like a book. This locking-fold was very compact, just not quite as small or lightweight (or relatively budget-friendly) as our pick. One knock on the Pop-Up? A lack of compatible car seat options. The stroller fits the Peg Perego Primo Viaggio 4-35 right out of the box, and fits any Maxi-Cosi, Cybex or Nuna seat with an adapter. This leaves out a large number of parents with Britax, Chicco, and Graco infant car seats. When buying a car seat and stroller, there are certainly many options. It’s generally best to choose a stroller first, given that there are many of them, and then find a compatible infant car seat. We’ve compiled a car seat compatibility guide to help make this easier, and of course, reading our own infant car seat guide helps in choosing the best one for you. If a reversible seat isn’t on your list of must-haves the Valco Snap 4 is an excellent basic stroller that gives frugal parents a fantastic alternative. The Snap4 utilizes a lightweight aluminum chassis and foam-core wheels that roll well on smooth surfaces and light terrain. The base stroller runs $250, but can be further customized with color packs that retail for $45. It also shares a common feature amongst our favorites: an inward fold. The Snap4 folds with a two-button sequence of events, collapsing on top of itself. A handle and shoulder strap are attached to the underside of the seat for easy transporting between cars or activities. While you won’t get the reversible seat that comes on our other choices, you will save some dough—and have one of the lightest travel-system compatible strollers on the block. We considered these numerous alternatives from manufacturers, but can’t recommend them. Baby Jogger City Mini Zip ($250) Three-step fold that while compact, leaves much of the frame exposed. Doesn’t tackle terrain well and works best as a travel or secondary stroller, not an everyday one. BabyRoues LeTour II ($500) Bulky fold and cheap materials. Awkward design that folds to leave pointed hinges exposed, posing a threat to whatever else is in your trunk. 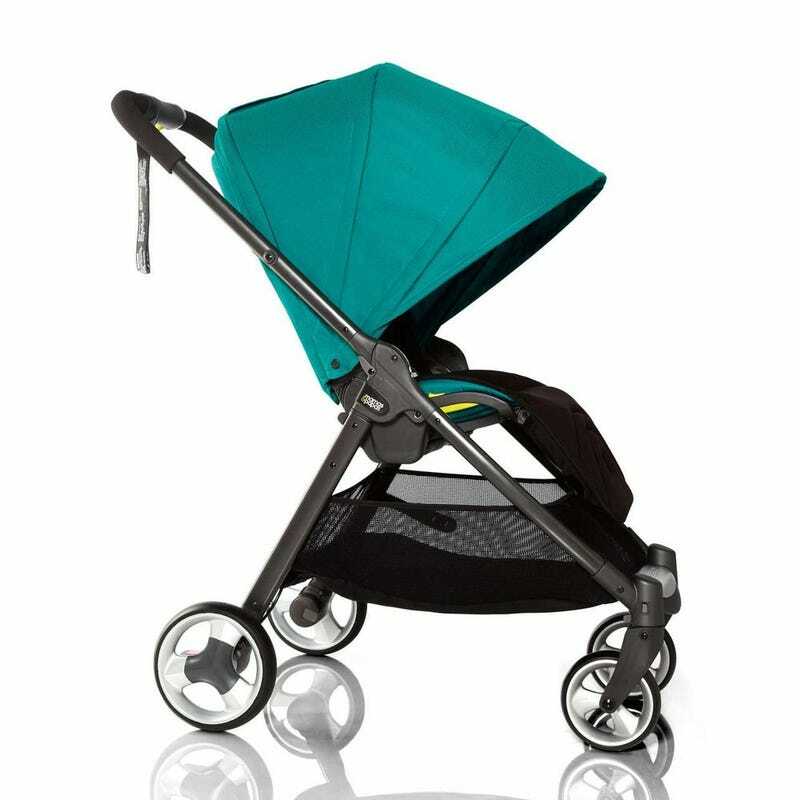 Bob Motion ($225) Heavier than similar offerings from Baby Jogger. Has limited car seat compatibility, and a short seat back. Britax B-Agile ($215) Our original winner hasn’t kept up with the competition, and while it still sells well, there are so many alternatives that have better features and that hold up better over time. Bugaboo Cameleon 3 ($1,120) Simply put, most parents aren’t willing to pay overall $1,000 for a stroller. Those who do will certainly enjoy the smooth ride and durability, but the two-part fold does take time, and expose the stroller’s handlebar to repeated meetings with the sidewalk. Bumbleride Indie 4 ($500) Air-filled tires require maintenance and add weight to the frame. Chicco Bravo ($230) Very little support on the seat. It sits low to the ground, making it harder to get babies in and out. Cybex Priam-Trekking ($990) Very high handlebar didn’t fit our shorter testers. Complicated fold that doesn’t lock into place. Better alternatives such as the Bugaboo and Orbit at that price point. Graco Breaze ($120) Two handle option limits mobility. Only fits specific Graco brand car seats. It’s also heavier than most umbrella strollers, making its placement awkward and with better alternatives on either side. Inglesina Trilogy ($500) Umbrella fold takes multiple steps and requires a lot of work. The handlebar jiggles when bumps are hit, making the ride insecure and uncomposed. Mountain Buggy Nano ($195) Adapter is universal and doesn’t work well on most seats. The wheels don’t roll well on any surface, and the whole thing feels like it’s held together by a couple of screws. It’s on deep discount now, probably because a change is near. Mountain Buggy Swift ($400) Pricey for what it is. A bare bones, non-jogging stroller that weighs more than it should based on its feature-set. UPPAbaby Cruz ($500) We liked the vertical design and storage, but found that the push just wasn’t comparable to our winner, and other similar price products. In addition, a recent recall makes us pause before recommending this. We want to point out that there are many other strollers out there and that our list consisted of single-seat strollers that were not considered joggers or umbrella strollers. All of our candidates fit into the standard or full-size stroller category, meaning that they fit a car seat and have a single stroller seat. We didn’t included any convertible (single to double) strollers, or joggers, because we have guides for those already. Try to do all of the above quarterly, or sooner if it’s needed. It’s also very important to use your stroller properly. This involves following the guidelines set by the manufacturer, like minimum and maximum child size. For example, the Mamas and Papas Armadillo Flip can fit a newborn baby, up to 50 pounds. Warranties do cover manufacturer defects and performance-related issues, but they won’t cover misuse, or problems that are the result of poor upkeep. Mamas and Papas gives customers a two-year warranty and offers friendly UK-based service for many inquires, so expect a British accent upon calling them if you ever run into a problem. Two new strollers strike our fancy: First up, from OXO, maker of kitchen gadgets and our favorite high chair, comes the Cubby Stroller. This is the brand’s first foray into wheeled goods, and it takes storage flexibility very seriously. It offers pockets along the rear of the stroller, in the basket, and in the canopy. The only downside to added storage? Not knowing in which (of many pockets) you left your phone. Another stroller to keep on your radar is from a new company called GreenTom. Creator and designer Bart Bost set out to create a greener, and simplified product. GreenTom will hit the United States in February 2016, and will be made domestically out of 100 percent recyclable and sustainable products. How do they do that? By using materials like soda bottles and castor bean oil to create a durable plastic frame. How durable? They use the same material to produce engine covers for the 2016 Mercedes A-Class, and for high-performance skis! Soda bottles also make up most of the seat fabric, in fact. But if it will be a good design remains to be seen. When Mamas and Papas test their strollers for safety and reliability, they do so by replicating pushing a 3-year-old for 143 miles on a rocky road. That’s a lot of mid-morning strolls and after dinner walks home. It shows. Out of over 30 models, we found that the Mamas and Papas Armadillo Flip is the best stroller around, with a lightweight frame, simple fold and a fully-reclining seat.